At Ashley House, we recognise the importance of environmental protection and the issues surrounding climate change. We do everything we can to reduce our carbon footprint and encourage our partners, customers and staff to do the same. We are committed to producing sustainable and eco-friendly print products, and strive to source products for our customers in a way which ensures that, together, we leave the lightest possible carbon footprint. Working with us will improve your own eco-credentials too! We continually assess our operations in an effort to improve our environmental performance; our aim is to be the most eco-friendly printing company in the UK. We reduce our carbon footprint by taking steps to &apos;lock up&apos; carbon emissions and contribute to tree planting and new woodlands in the UK. Ashley House is affiliated with the Woodland Trust carbon capture scheme which was the winner of the Green IT Awards &apos;Best Carbon Scheme&apos;. The Woodland Trust itself is the country’s largest woodland conservation charity. By using Ashley House you helped us to plant over 1,854m2 of new woodland trees in the UK, in 2016 alone! As a corporate partner in the scheme, we&apos;ve agreed to purchase at least 60 tonnes of carbon captured paper every year; one tonne of paper purchased by us equates to 14m² of new woodland planted and half a tonne of CO2 captured. In 2016 we removed an incredible 74,190 kg of Carbon Dioxide! We were already helping The Woodland Trust by purchasing carbon-captured paper, but we wanted to do more than that. We decided that we wanted, as a company, to volunteer a day on which to plant the trees ourselves! 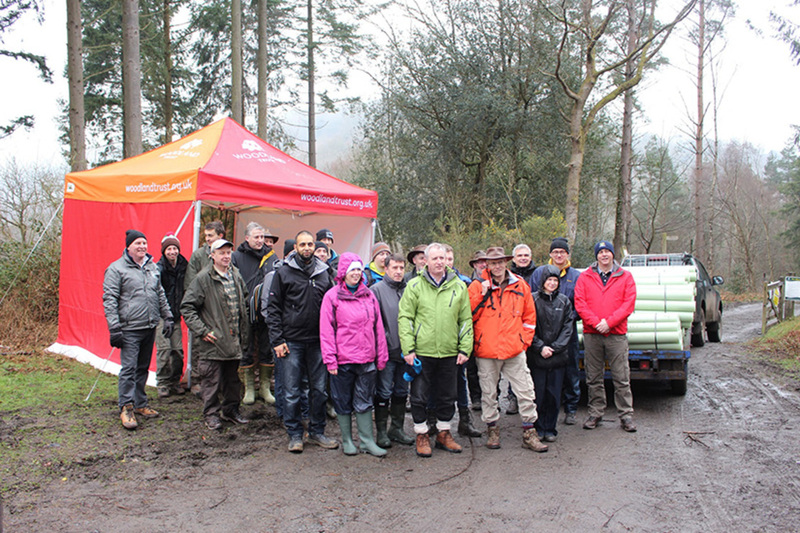 On the 23rd of March, 2017, in the torrential rain, we planted over 1,000 sapling trees on our carbon-capture tree planting day at Pullabrook Wood, located within the Bovey Valley National Nature Reserve. We were rewarded by the enormous sense of achievement which results from helping to regenerate a beautiful area of native UK woodland that is vital for wildlife. The Woodland Trust state that just 13% of the UK is covered with trees. For the average European country, this figure is much higher at around 37%. Furthermore, since the 1930s, over half of the UK&apos;s ancient woodlands have been destroyed. We will lose even more as airports, roads and railways expand, as houses are built and as diseases are introduced and attack. 60% of our animal and plant species have declined in numbers over the past 50 years. Many are now endangered; some face extinction - this is down to a decline in our trees, and we want to stop this! Planting trees has an enormous effect on wildlife numbers, increasing them dramatically. Re-introduced species of birds, butterflies, small mammals and birds of prey will start to re-appear in woodlands across the UK as the programme develops. View our carbon capture certificate.